Host: Depending on which global region is being used, one of the following will be entered. Password: The password is the same one used for Thru portal authentication. 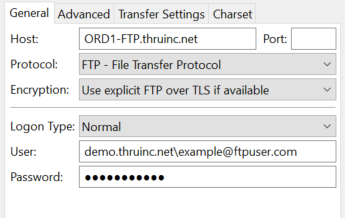 Egress connections to Thru FTP services may need to be enabled on a corporate firewall. * If the error “The server rejected SFTP connection, but it listens for FTP connections” appears after attempting the authenticated connection. It is most likely that the Thru FTP host has to be added to the firewall whitelist.